n' = n(v+w-vL)/(v+w-vS) where ‘v’ is the velocity of sound, ‘w’ is the wind velocity ‘vL’ is the velocity of the listener, ‘vS’ is the velocity of the source of sound and ‘n’ is the real frequency of the sound emitted by the source. You should clearly note that all the velocities in this expression are in the same direction and the source is behind the observer. It will be helpful to remember that if the source moves towards the listener or the listener moves towards the source, the apparent frequency increases. If they move away, the apparent frequency decreases. Doppler Effect in light is used to calculate the recessional velocities of stars and galaxies by measuring the ‘red shift’. When the star moves away from the observer, as is the case with our expanding universe, the wave length of the light emitted by the star appears to be increased (shifted towards red colour). From the above expression for apparent frequency, the shift in frequency which is equal to (n-n') is related to the recessional velocity vS by the equation. This relation is often written as v = zc where z =(λ'-λ)/λ which may be called the ‘spectral shift’ or ‘Doppler shift’. You may get questions involving the calculation of the recessional velocities of stars using the red shift. Questions involving blue shift as well as red shift may be asked for calculating the velocity of aircraft and automobiles which reflect microwaves transmitted by a radar. Since the speed of light is much greater than the speed of material bodies, the Doppler shift for a given relative velocity is the same, whether the source moves or the observer moves. Beats are produced here because of the superposition of the direct sound of actual frequency n (equal to 272Hz) from the whistle and the reflected sound of apparent frequency n’, given by n’ = n(v+w-vL)/(v+w-vS). [Note that The frequency of the direct sound is unchanged since both the source and listener are moving together and there is no relative velocity between them]. In the expression for the apparent frequency of the reflected sound, the wind velocity (w) is zero. The velocity of source (vS) is positive since the source is the reflected sound image of the whistle and this image moves towards the listener. The velocity of the listener is negative since he is moving towards the reflected image serving as the source. Therefore, n' = n(v+vL)/(v-vS) = 272(345+5)/(345-5) =280Hz. [Note that 18km/hour = 5m/s]. Number of beats per second = 280-272 = 8. Problems of this type are often found in entrance test papers. When the engine approaches the observer, the apparent frequency is v/(v-vS) and when it moves away from the observer, the apparent frequency is v/(v+vS). The frequency therefore changes in the ratio (v+vS)/(v-vS). We have therefore, (v+vS)/(v-vS) =9/8 from which the velocity of the source, vS = v/17 = 340/17 = 20m/s. This is a case increase in apparent frequency due to the motion of the source. Since there are no beats, the apparent frequency [v/(v-vS)]n of the whistle of A is the same as that of B so that we have, [330/(330-15)]n = [330/330-30)]×600 so that n/315 = 600/300 from which n = 630 Hz. vS = c(n'-n)/n' = 3×108(3×103)/(9×109) = 100 m/s. The velocity of aircraft is half that of the reflected image (source). So the answer is 50 m/s. We have v = zc where z = (λ'-λ)/λ. Therefore, the recessional velocity = [(5004-5000)/5000] ×3×108 = (4×3×108)/5000 = 2.4×105 m/s. Note that you can substitute the wave length in the given unit itself since z is a ratio of wave lengths. 176(330-vL)/(330-22) = 165(330+vL)/330, from which vL = 22 m/s. Some of you might be scared of questions on reflection and refraction at spherical surfaces. This unnecessary fear is due to your confusion about the inevitable sign convention used while discussing spherical mirrors and lenses. The sign convention used widely in Optics is the Cartesian sign convention. The ray incident on the curved surface is to be considered as proceeding in the positive X-direction and you have to measure all distances from the pole, which is supposed to be the origin. Often you may be given a ray diagram in which the incident ray may be proceeding in the negative X-direction. To avoid confusion, imagine that the direction of the incident ray is still in the positive X-direction. You can even redraw the diagram to make the incident ray proceed from left to right if you want. The signs given to the distances are as in the Cartesian coordinate system: Distances measured from the pole towards right are positive and distances measured from the pole towards left are negative. Similarly, distances measured (from the pole) upwards are positive and those measured downwards are negative. Normally you will encounter problems involving leftward and rightward measurements. While solving problems, apply signs to all known quantities in accordance with the sign convention. Leave the unknown quantities as they are in the formulae. You will be able to arrive at conclusions by interpreting the sign of the unknown quantity you arrive at finally as the answer. For instance, if the distance of an image is obtained as negative, you will immediately understand that the image is on the same side of the curved surface as the object is. If the focal length of a lens is obtained as negative, you will understand that it is a concave lens. If the focal length or the radius of curvature of a mirror is obtained as positive, you will understand that it is a convex mirror. n2 /v – n1/u = (n2 – n1)/R where ‘v’ is the image distance, ‘u’ is the object distance and ‘R’ is the radius of curvature of the refracting surface. (2) Lens maker’s equation: 1/f = (n2/n1 – 1)(1/R1 – 1/R2) where ‘f’ is the focal length of the lens, R1 and R2 are its radii of curvature, n2 is its refractive index and n1 is the refractive index of the medium in which the lens is placed. If the lens is placed in air or vacuum, lens maker’s equation becomes 1/f = (n – 1)(1/R1 – 1/R2) where 'n' is the refractive index of the lens. [It is better that you remember the general Lens maker’s equation since you will encounter questions in which the lens is placed in liquids such as water]. (3) Law of distances (Lens formula): 1/f = 1/v - 1/u where ‘f’ is the focal length of the lens, ‘v’ is the image distance and ‘u’ is the object distance. 1/F = 1/f1 + 1/f2 + 1/f3 + …etc. where f1,f2,f3...etc. are the focal lengths of the individual lenses. [ Note that this is a power equation since the reciprocal of focal length is the power (focal power) of the lens]. 1/F = 1/f1 + 1/f2 – d/f1f2 where ‘d’ is the separation. (6) Formula for calculating the focal length by displacement method (conjugate position method): f = (D2 – d2)/4D where D is the distance between the object and the screen (image) and ‘d’ is the displacement (distance between conjugate positions). (7) Linear magnification, m = size of image/size of object = v/u [Note that by ‘size’ we mean linear size]. ω1/f1 + ω2/f2 = 0 where ω1 and ω2 are the dispersive powers of the materials of the lenses. This can be written as ω1/f1 = -ω2/f2 indicating that one lens is converging while the other is diverging. [Note that crown glass and flint glass lenses are used for achromatic doublets and if you require a converging doublet, the converging lens is to be made of crown glass since the dispersive power of crown glass is less than that of flint glass. You will then have smaller focal length for the converging lens to make the achromatic combination converging]. image of the object O. The object distance 'u' is PO and the image distance ‘v’ is PI. [P is the pole of the spherical surface]. We have, n2 /v – n1/u = (n2 – n1)/R so that 1/v – 1.5/(-3) = (1- 1.5)/(-5). Note that we did not bother about the sign of the unknown quantity ‘v’. [In this problem we could have put negative sign for ‘v’ since the image I is on the same side as the object. Since we don’t apply sign to the unknown quantity ‘v’, we will obtain a negative value for ‘v’ on solving the problem]. The sign of ‘u’ is negative in accordance with the Cartesian convention. Since the incident ray is encountering a concave surface the radius of curvature is negative, in accordance with the convention. Rearranging the above equation, we obtain 1/v = 0.5/5 – 1.5/3 = -6/15 from which v = -2.5cm. If h1 and h2 are the sizes of the of the image in the two conjugate positions, the size of the object is given by h = √(h1h2) = √(9×1) = 3cm. Considering the formation of the image in the first case, we have v/u = 9/3 so that v = 3u. Also, v = 20+u since v and u interchange in the conjugate positions. Therefore, 3u = 20+u from which u = 10cm. v = 20+u = 30cm. Focal length f = uv/(u+v), since v is positive and u is negative in the equation, 1/f = 1/v - 1/u. Therefore, f = 10×30/(10+30) = 7.5cm. [Note that the answer is positive as expected for a convex lens]. You should note that the radius of curvature of an equi-convex (or equi-concave) lens is equal to its focal length if the refractive index is 1.5. You can check it by substituting R1 = R2 = f in the lens maker’s equation: 1/f = (n – 1) [1/f – 1/(-f)] = (n – 1)×2/f, from which n = 1.5. So the correct option is (e). You should also note that the focal length of a plano-convex or plano-concave lens is twice the radius of its curved face if the refractive index is 1.5. (a) convergent lens of focal length 3.5R (b) convergent lens of focal length 3.0R (c) divergent lens of focal length 3.5R (d) divergent lens of focal length 3.0R. On substituting the given quantities in the lens maker’s equation, 1/f = (n2/n1 – 1)(1/R1 – 1/R2), we have 1/f = [(1.5/1.75)-1] [1/(-R) – 1/R)] = (-0.25/1.75) (-2/R) = 0.5/1.75R, from which f = 3.5R. You should ensure that all your doubts on applying the sign convention are cleared before proceeding to the next question. In the lens maker’s equation, we applied negative sign to the radius of curvature (R) of the first surface since the concave lens presents a concave surface to the incident ray (and hence the centre of curvature is on the same side of the pole as the object is). The sign of the radius of curvature of the second surface is positive since it presents a convex surface to the ray proceeding towards it after the refraction at the first surface. We did not bother about the sign of the focal length of the lens, since it is the unknown quantity in this problem. The sign turns out to be positive, indicating that the concave lens behaves as a converging lens on immersing it in a denser liquid. The correct option therefore is (a). You should note that a divergent lens becomes convergent (and a convergent lens becomes divergent) on immersing in a denser medium (of greater refractive index). 1/20 = [(1.5/1) – 1] (1/R1- 1/R2). We are not bothered about the signs of R1 and R2 since they are unknown quantities. 1/f = [(1.5/1.6) – 1] (1/R1 – 1/R2). Dividing the first equation by the second, we obtain f/20 = 0.5×1.6/(-0.1) from which f = -160 cm [Option (e)]. When you direct a ray of light (through the un-silvered surface) in to this lens, the ray will be reflected by the silvered face. Therefore, the ray undergoes refraction twice at the lens and the effect is to make the lens a biconvex one, as though we are keeping two identical plano-convex lenses in contact, the only difference being that the ray is sent back. The focal length of the silvered lens therefore becomes half that of the un-silvered one. So, the answer is 10cm [Option (b)]. In this problem, the silvered surface, being plane, acts just to return the ray. If the curved surface were silvered, it would have acted as a spherical mirror complicating the problem. But, there is no significant complication and you can tackle the problem using the general expression for the resultant focal length (F) given by 1/F = 1/f + 1/fm + 1/f. Or, 1/F= 2/f + 1/fm. Here ‘f’ is the focal length of the un-silvered lens while fm is the focal length of the mirror. The power of the un-silvered lens appears twice and the power of the mirror appears once in this equation. When you use this equation for solving the above question, the mirror term will vanish since the focal length of a plane mirror is infinite and you get F = f/2. As you know, the power (expressed in dioptre) is the reciprocal of the focal length in metre. A convex lens (or, generally a converging lens) has positive power while a concave lens (or, generally a diverging lens ) has negative power. When you combine lenses in contact, the net power (P) of the combination is equal to the algebraic sum of the individual powers: P = P1+P2+P3+…. In the present case, P = (1/0.4) + (-1/0.25) = 2.5 – 4 = -1.5 dioptre. This too is a simple question. The power of the combination is 1/0.3 dioptre. [Note that the power of the combination is positive since the focal length of the combination is positive]. The concave lens has therefore smaller power and since the ratio of magnitudes of powers is 2:3, we can write -2k+3k = 1/0.3 where ‘k’ is the constant of proportionality. From this, k = 1/0.3 so that the powers of the concave and convex lenses are respectively – (2/0.3) and +(3/0.3). Therefore, their focal lengths are – (0.3/2)m and +(0.3/3)m. The focal lengths in cm are -15 and +10 [Option (b)]. In continuation of the post on 5th October 2006, let us discuss some more questions on electromagnetic induction. Generally, students are enthusiastic in working out problems in electromagnetic induction. The easiest method of solving this problem is to find out the velocity (v) of the centre of the rod and calculate the potential difference developed between the ends of the rod using the expression, V = BLv, for the motional emf (V) in a straight conductor of length ‘L’ moving in a magnetic field with velocity ‘v’. The value of ‘v’ is the velocity of the centre of the conductor which is ωL/4 since the centre is at a distance L/4 from the axis of rotation. So the answer is BL(ωL/4) = ¼ BωL2 . If this method does not look sufficiently appealing to you, you may use the expression for the voltage induced across a conductor of length ‘L’ rotating about a perpendicular axis through one end: V = ½ BωL2 . In the present case, you have to imagine two conductors of lengths ¾ L and ¼ L respectively. The potentials at their ends with respect to the point O (through which the axis of rotation passes) are ½ Bω(9/16)L2 and ½ Bω(1/16)L2 . The potential difference between the ends is therefore (9/32)BωL2 – (1/32) BωL2 = ¼ BωL2 . You should remember that the self inductance of a coil is equal to the magnetic flux linked with the coil when unit current flows in it. The flux linked with the coil is directly proportional to the number of turns in the coil. It is directly proportional to the magnetic field (produced by the coil) also, which again is directly proportional to the number of turns. Hence the self inductance is directly proportional to the square of the number of turns. The self inductance of the coil mentioned in the question will therefore become 6.25 times the initial value. The following MCQ also is simple but there is chance of picking out a wrong answer. A plane rectangular coil is rotating with angular velocity ‘ω’ in a uniform magnetic field. If the axis of rotation is parallel to the plane of the coil and perpendicular to the magnetic field, what is the phase difference between the magnetic flux linkage and the induced emf in the coil? If you take the time to be zero when the plane of the coil is perpendicular to the magnetic field B, the flux (Φ) at any instant can be written as Φ = BAcosωt where A is the area of the coil. The induced emf, V = -dΦ/dt = BAω sinωt. Since the flux is a sine function and the induced voltage is a cosine function, the phase difference between the flux linkage and the induced emf is π/2. [If you take the time to be zero at some instant when the plane of the coil is parallel to the magnetic field, Φ = BAsinωt and V = -BAω cosωt. Again, one is a sine function and the other is a cosine function, indicating a phase difference of π/2]. (a) magnetic flux through the coil (b) area of the coil (c) rate of change of magnetic flux through the coil (d) product of magnetic flux and area of the coil. The correct option is (c). Note that there has to be a time rate of change of magnetic flux for obtaining an induced voltage. Since the rod is lying along the east-west direction, it will cut the horizontal magnetic field lines of the earth. The motional emf developed between the ends of the rod is V = BLv = 0.3×10-4×10×5 = 1.5×10-3V = 1.5mV. The resistance of the coil will become 16 times the initial value since there is a four fold increase due to the four fold increase of length and another four fold increase due to the four fold decrease in the area of cross section (when the radius is reduced to half the initial value). Note that the resistance is given by R = ρL/A where ‘ρ’ is the resistivity, L is the length and A is the area of cross section. The induced voltage in the coil is increased to four times since the number of turns is made four times. We have, power P = V2/R. So, when the value of V is quadrupled and the value of R is made 16 fold, the value of P remains unchanged and hence (b) is the correct option. You should become capable of working out things in your mind, without wasting time in writing mathematical steps, when you deal with questions of this type. A fish looking from within water sees the outside world through a circular horizon. If the fish is √7 m below the surface of water, what will be the radius of the circular horizon? Note that refractive index of water is not given. You are expected to remember it. Most of you know it as 1.33. On many occasions it will be useful to remember the value as 4/3. 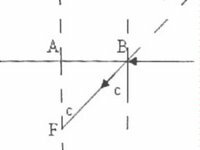 As you can see from the figure, the fish at F can see the outside world through a cone of semi angle equal to the critical angle ‘c’ of water because the rays of light at grazing incidence are refracted in to water at critical angle ‘c’. The circular horizon meant in the question has radius AB which is equal to √7 tan c. We have sin c = 1/n = 1/(4/3) =3/4. 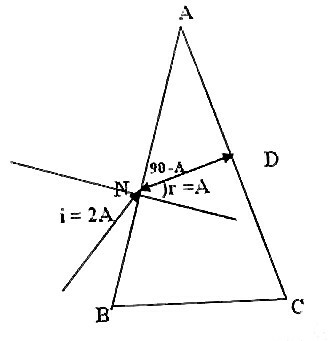 To obtain tan c, you may imagine a right angled triangle having opposite side 3 and hypotenuse 4 to obtain the adjacent side √7 so that you get tan c = 3/√7. you get the answer as 3m. 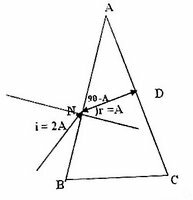 Since the ray retraces its path on falling (at D) on the silvered face AC of the prism, it follows that it is incident normally on this face. The angle of refraction (r) at the first face is shown in the figure. From the triangle NAD, angle DNA = 90-A. Therefore, r = A. The refractive index of the material of the prism is therefore given by n = sini/sinr = sin(2A)/ sinA = 2sinA cosA/sinA = 2cosA. In the minimum deviation position, we have μ = sin[(A+D)/2] / sin(A/2) where D is the minimum deviation. Putting D = A, as given in the question, we obtain μ = sinA/sin(A/2) = [2sin(A/2)cos(A/2)]/sin(A/2) = 2cos(A/2). Therefore, cos(A/2) = μ/2, from which A = 2cos-1 (μ/2). One face A of a glass slab of thickness ‘t’ is silvered. An ink mark is made on the opposite face B. If you look through the face B, what is the distance between the ink mark and its image formed by reflection at the silvered face? (Refractive index of glass is μ). When you look through the face B, the silvered face A (which is at the real distance ‘t’ from B which carries the ink spot) will appear to be at the apparent distance t/μ from B (and the ink spot). The reflected image of the ink spot is at the same distance t/μ behind the apparent silvered face. So, the distance between the ink spot and its reflected image will be (t/μ + t/μ) = 2t/μ. Questions on reflection and refraction at plane surfaces are interesting to answer, but those involving spherical surfaces may pose some problems to you. Let us discuss some questions involving reflection and refraction at plane surfaces. (We will discuss questions involving spherical surfaces later). Here 4 cm and 2 cm are the apparent distances of the air bubble on looking through the two faces. If ‘d’ is the real distance, we can write the refractive index (n) as n = d/4 = (9-d)/2. [We have written n = (Real distance)/(Apparent distance) for the two cases]. From this, d = 6 cm so that n = 6/4 = 1.5. Total apparent depth = (t1/n1) + (t2/n2) + (t3/n3) +…etc. 4t/3 = t/μ + t/1.2μ from which μ = 1.375. If he looks from a point just above the glass slab, the ink mark will appear to be at 3/n = 3/(3/2) = 2 cm. Since he is looking from a distance of 5-3= 2 cm from the top of the slab, the ink mark will appear to be at 2 + 2 = 4cm. (a) 41º with respect to the horizontal (b) 49º with respect to the horizontal (c) 42º with the vertical (d) 45º with the horizontal (e) 37º with the horizontal. The correct option is (a) since the critical angle for water is nearly 49º and this angle is with respect to the vertical in the present case. The angle with the horizontal is therefore 41º. It will be convenient if you remember the critical angle of water and glass. In many problems you will encounter crown glass of refractive index 1.5. Its critical angle is 41.8º, which is roughly 42º. Critical angle for water is 48.75º, which is roughly 49º. You will come across many questions involving refractive index value of √2. This value has sanctity only for setting questions! It will be convenient to remember the critical angle of 45º for a substance having refractive index of √2. [Note that critical angle and refractive index of any medium is with respect to free space (or, air) unless specified otherwise]. Basically, you are asked to state which colour will produce the least apparent shift. The apparent shift = (Real distance - apparent distance) = t – (t/n). Since the refractive index (n) is the minimum for red, the least apparent shift is for red. So, red letters will appear least raised. [Since the refractive index is the maximum for violet, letters of violet colour will appear most raised]. When light rays are incident at an angle of 60º on one face of a glass prism, minimum deviation occurs. If the angle of minimum deviation also is 60º, what is the refractive index of the material of the prism? Under the condition of minimum deviation, the angle of incidence (i1) and the angle of emergence (i2) are equal (each equal to i). Since i1+i2-A = d where‘d’ is the deviation, we have 2i – A = D when the deviation is the minimum (D). Therefore, 120º - A = 60º, from which A = 60º. The refractive index is given by n = sin [( A+D)/2] / sin (A/2) = (sin60)/sin30 = (√3 /2)/(1/2) = √3. Albert Einstein was awarded the Nobel Prize in Physics (1921) for his explanation of photoelectric effect and not for his much more famous Theory of Relativity. You will come across questions based on Einstein’s photoelectric equation in almost all Medical and Engineering Entrance Tests. (1) hν = KEmax + Φ where ‘h’ is Planck’s constant, ‘ν’ is the frequency of the incident photon, KEmax is the maximum kinetic energy of the electron emitted from the surface on which the photon is incident and ‘Φ’ is the work function of the surface. (2) KEmax = hν–hν0 = h(ν–ν0) where ν0 is the threshold frequency which is the minimum frequency (of the photon) required for photoelectric emission. Note that we have written the work function in terms of the threshold frequency as Φ = hν0 which can also be written as Φ = hc/λ0 where λ0 is the threshold wave length and ‘c’ is the speed of light in free space. Therefore, KEmax = hc[1/λ – 1/λ0]. (3) ½ m(Vmax)2 = h(ν–ν0) where Vmax is the maximum velocity of the photoelectron. (4) eVs = h(ν–ν0) where ‘e’ is the electronic charge and Vs is the stopping potential which is the negative voltage to be applied on the anode to prevent photo electric emission. Since the work function is given in electron volts you have to write its value in joule and equate to hc/λ0. You know that Φ electron volt is equal to Φe joule where ‘e’ is the electronic charge. So, we have Φe = hc/λ0 from which λ0 = hc/eΦ. In the first case, we have eV1 = h(ν1–ν0) where ν0 is the threshold frequency. In the second case, we have eV2 = h(ν2–ν0). Subtracting the first equation from the second, e(V2- V1) = h(ν2–ν1), from which V2 = V1 + h/e(ν2–ν1). So, the correct option is (b). [If you find this more convenient, you may do it this way: The extra energy available with the photon of frequency ν2 = hν2 - hν1. So the extra stopping potential (ΔV) required is given by e(ΔV) = hν2 - hν1, from which ΔV = h/e(ν2–ν1). Therefore V2 = V1 + h/e(ν2–ν1)]. The correct option is (e) since the energy of the incident photon is 12400/6200 = 2 eV, which is insufficient for photoemission in the present case. [Note that the product of the energy in electron volts and the wave length in Angstrom Units in the case of photons is equal to 12400. Remember this to facilitate easy calculation of energy or wave length when one quantity is given]. (a) each emitted electron carries a quarter of the initial kinetic energy (b) The number of electrons emitted is a quarter of the initial number (c) each emitted electron carries one sixteenths the initial kinetic energy (d) the number of electrons emitted is one sixteenths the initial number (e) the number of electrons emitted and the energy of each electron are one sixteenths the initial values. The solution becomes quite simple if you express the energy of the photon in electron volt. Since the product of the wave length in Angstrom and the energy in electron volt is 12400 for any photon, the energy of the photon in the problem is 12400/2000 = 6.2 eV. In accordance with Einstein’s equation, 1.2 eV [which is the work function] is spent for removing the photoelectron from the surface and the remaining 5 eV is transferred to the photo electron (as its kinetic energy). To ‘kill’ this energy of the photo electron you have to apply a retarding potential of 5 volts. So, the correct option is (b). The energies of the photons are hf1 and hf2 and therefore the kinetic energies of the photo electrons are hf1-Φ and hf2-Φ respectively, where Φ is the work function. Therefore, ½ mv12- ½ mv22 = hf1- hf2, from which v12 - v22 = 2h(f1 - f2)/m. So, the correct option is (b). You might have heard of the thermionic work function. Is it greater than or equal to or less than the photo electric work function? You should note that these two work functions are the minimum energy required to remove the electron from the surface of the emitter. In thermionic emission, the electron is removed by supplying heat energy. In photo electric effect, the required energy is supplied by the incident photon. In both cases the energy required for removing the electron from a given surface is the same. Therefore, thermionic work function of a given surface is exactly equal to its photo electric work function.